300: RISE OF AN EMPIRE FROM WARNER BROS.
300: RISE OF AN EMPIRE hit theaters on March 7th and was promptly #1 in the US box office and was also tops in worldwide box office. 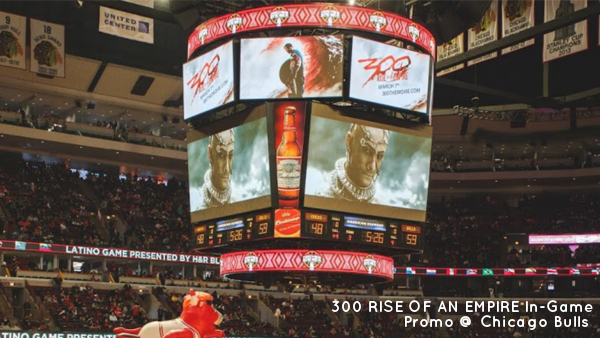 The Prodigy Sports team worked on in-game promos with a selection of NBA and NHL teams leading up to the opening weekend (Chicago Bulls, Pittsburgh Penguins, Portland Trail Blazers, and Boston Celtics). The LA Times Health section interviewed world-renowned trainer Mark Twight about how he got the actors and actresses in tip-top shape for the film. Rodrigo Santoro spoke to the Washington Post sports page about his love of soccer, Callan Mulvey talked to Yahoo ThePostGame about how he prepared for the role and his love of boxing, and producer Bernie Goldman chatted about the film with Fox Sports Radio “Jay Mohr Sports” at the LA premiere.